Guests attending the 2018 Wings Over North Georgia Air Show can experience the aerial action through our Vintage Aircraft rides program! Guests can purchase a ticket and climb aboard the Viet Nam era “HUEY” support or the “COBRA” attack helicopter. 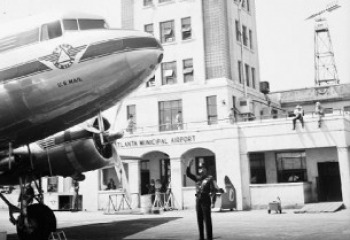 These aircraft assets are operated by the Army Aviation Heritage Foundation flight teams. All riders will enjoy a safe flight experience seeing the scenic North Georgia foothill countryside. Guests can purchase ON-SITE tickets during the air show weekend (Saturday & Sunday). Presented by the Army Aviation Heritage Foundation, the UH-1 “HUEY” helicopter ride will be a patriotic and inspirational experience! The UH–1 “HUEY” entered U.S. Army service in 1958 with more than 9,440 different aircraft having been procured over thirty five years. 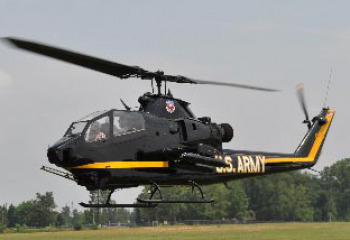 The HUEY was the first mass-produced turbine powered helicopter to enter Army service. This version, the UH–1H, was designed as a troop transport and could carry ten soldiers and a crew of three. 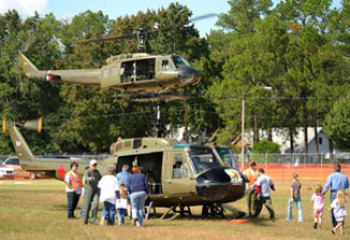 The HUEY is widely identified with the Vietnam War and remains in Army National Guard service to date. The HUEY has been a true “work horse” of modern Army Aviation. Presented by the Army Aviation Heritage Foundation, the AF-1F “Cobra” helicopter ride will be a patriotic and inspirational experience! The AH-1F Cobra Attack Helicopter was designed at inception as America’s first true attack helicopter. Our aircraft sport proven combat pedigrees and, combined with their gleaming Black and Gold paint scheme, have a striking presence on the ground and in the air.